Check out these handy guidelines for proper bin presentation…. Please put your bin(s) out for collection before 5.30 a.m. Your bin(s) should be left outside your premises at the kerbside where they can be clearly seen by the bin collectors. Bins over 50kg in weight cannot be collected for health and safety reasons. Ensure your bin lid is closed and materials are not at risk of falling out. 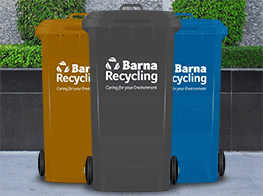 Please remember you are responsible for your waste until it has been collected by Barna Recycling. Customers on our pre-pay service receive text messages outlining the balance on their account. While every effort is made to ensure the accuracy of this data, we must advise that this may not always be accurate due to the timing of transactions between the vehicles, weighing devices and the office. We apologize for any inconvenience caused and we encourage you to keep your account topped up at all times in order to assure continuity of service.